Blue Origin's reusable New Shepard rocket and capsule launch from West Texas during the duo's fourth successful test flight on June 19, 2016. With multiple flights of its New Shepard vehicle under its belt, Blue Origin is appraising the research market for scientific and technological experiments that can be lofted to suborbital space. During its suborbital flights, the New Shepard capsule gets at least 62 miles (100 kilometers) above Earth, exposing payloads to microgravity conditions for about 3 minutes. Scientists have already taken advantage of this research opportunity. "Our last two flights, we flew payloads as part of our pathfinder series," Blue Origin President Rob Meyerson told Space.com. "We received feedback from the researchers, moving us one step closer to offering good customer experience for our future payload customers." The Texas-based company NanoRacks has partnered with Blue Origin to provide payload-integration services. The goal is "to finally offer a seamless transition from suborbital research to long-duration [research] on board the International Space Station," said NanoRacks CEO Jeffrey Manber. "Researchers can now tinker on board New Shepard, get their projects squared away and, for some, move on to the space station," Manber told Space.com. Blue Origin's New Shepard rocket approaches its landing site in West Texas during the vessel's fourth launch and landing test on June 19, 2016. Meyerson said that he considers suborbital research "an untapped market," but just how big that marketplace is remains unclear. "When we get the system up and running and reaching the flight rates we think we'll be able to do, we'll see if there's a market that can support increasing that flight rate," Meyerson said. "Until you have a product to sell, it's really hard to tell." Blue Origin is building a fleet of vehicles that support flights on the order of once a week, Meyerson said. "We are designing the system so that it can be turned around on less than a 24-hour cycle. It's going to take us time to get there … but our team is happy with where we now are," he said. "Every flight, we are looking at ways to streamline the operation, learning how to improve the system." New Shepard is a unique platform, Meyerson said, "in between the zero-gravity aircraft and sounding rockets. It provides a little less microgravity time than a sounding rocket, but at lower cost … and quite a bit more microgravity time than a zero-G aircraft, at a little more cost. So, it's in the sweet spot." There's a range of "uplifting" prices for a complete, end-to-end integration of a payload, from $50,000 to $100,000 depending on locker size, Meyerson said. Additionally, there's an introductory discounted price of $5,300 for student payloads. The New Shepard capsule contains 530 cubic feet (15 cubic meters) of interior space, more than 10 times the room available to the spacecraft's namesake, NASA astronaut Alan Shepard, on his history-making Mercury flight in 1961. New Shepard is being designed to house combinations of payload racks and seats. In coming years, scientists will be able to ride along with their experiments, said Blue Origin Business Development Manager Erika Wagner. "Automating your payload is a huge cost," Wagner told Space.com. "If you can actually put your own trained hands in the loop, that can be a real value." Wagner said that Blue Origin wants to make flying payloads on New Shepard easy. "We're trying not to throw the book at the investigators in terms of how much paperwork they have to fill out to fly with us," she said. The flight profile of Blue Origin's New Shepard suborbital vehicle. New Shepard is also being outfitted with external as well as internal payload interfaces. "Experimenters can have something exposed to the [space] environment," Meyerson said, adding that this capability will allow researchers to study upper-atmospheric phenomena or advance the readiness level of their technologies. In the future, Blue Origin also plans to offer the option of flying vehicles other than the New Shepard capsule atop the rocket, Meyerson said. "So that could be some kind of atmospheric demonstrator flight vehicle. 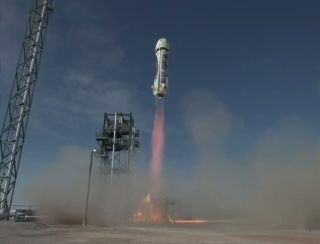 They can use the New Shepard booster to lift it off to a staging point," Meyerson said. "We look forward to hearing from different organizations as we transition our vehicle to regular commercial use." Blue Origin has a vision, Meyerson said, "of having millions of people living and working in space. We think if you want to get there, you need to be pushing the barriers of how to conduct really useful science ... of trying things out in microgravity." New Shepard is that first step, Meyerson said. The suborbital system is "a pathway to go to the International Space Station for longer duration," he said. "Eventually, we'll have our own vehicles and ways to do that as well. New Shepard is the forerunner for doing that. It's a stepping stone towards that long-term vision."